Good Morning Losties! Welcome back! It's been 8 long months since we saw Future Jack talking to Future Kate about a Future Island getaway. And never has there been a cliffhanger that was able to generate THIS much discussion and that was able to sustain a rabid fanbase for THIS extended of a gap between episodes! Well, I should learn from Hugo himself, never say never! But, I think we all deserve some credit for our patience this time around! I'm not going to get into a whole diatribe (there's a 5 dollar word) on the writer's strike in this blog. If it gets resolved it gets resolved. Most likely, we're not getting 16 episodes this winter/spring. Let's just take this time to celebrate the great return of a legendary show. A show that will go down in the history books and the futurey books! (yeah yeah yeah...so I'm making up words, whatever! I'm just excited that We're back and "WE'VE HAD TO GO BACK" for 8 long months now! Okay, enough lame one-liner references to the show. It's time to get to business! I know you're all waiting for my one word assessment of Season 4's Premiere episode "The Beginning of the End." And well, I've been working on that word all night (even was haunting my dreams trying to figure out what word to use!) But, I figured it out...and here goes nothing............"WOW!!!!!!!!!!!!!!!!!!!!!!!!" Ahhh yes, not only has the show returned, but so has the infamous "WOW!" Definitely a wow episode handed to us by the LOST team to kick things off this year....and from what I'm hearing, the WOWs will keep on coming! Season 4 is kicking this LOST party into overdrive. And with 16 episodes a season (strike pending), this means no more filler episodes! Okay, so brief synopsis of the episode before we start diving into some crazy things we saw! Pretty much the ultimate goal of the episode was to get all of the island inhabitants (minus The Others last seen heading to the temple) into ONE location by the end of the episode. Ben still trying to warn the Radio tower crew about the BAD PEOPLE coming. Desmond, returning from the looking glass, and the beach crew trying to confirm the same thing! This reunion was proven difficult due to a certain lady with a literal Knife in her Back, deciding to stay alive for a bit and run away! But this goal was also helped by the fact that a certain rotund beach dweller got so upset that he threw a walkie talkie into the ocean! (ummmm okay, that's a little weak for a plot movement device, but I'll buy it for the sake of the story!) Also to add more depth to these Island adventures, we get yet another glimpse at the future but from the perspective of another island escapee! Camera opens on a tower of mangos with a backdrop of an ocean (we're on the island, or are we? we've been fooled before in these season premieres!). BAM SPLAT! A red 1970's Camaro flies through the mangos and the ocean backdrop is just a trailer. We see a man watching this high speed pursuit on his nice Plasma TV, preparing himself what looks to be a screwdriver. It's JACK! Not a bearded Jack though, a Jack that doesn't look much different than current Island Jack. Our Car Dweller?None other than Hurley! Yes folks, Hugo gets off the island too! But what toll has this taken on him? Let's dive in and discuss! Even though this was a Hugo-centric flash forward, we do get a glimpse into Jack beginning his drinking problem. But it is worth noting that at this point, he still has his act together. Can't say the same for ol' Hurley! The car chase ends with Hurley slamming into that crazy Bonneville Car of Death being slammed into by the Camaro. 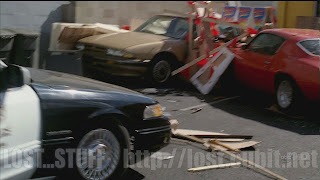 Yep the same car that was used to run over Michael in his flashback, the same car that Kate crashed into when running out of the hospital with her childhood sweetheart, and the same car that may have driven by Anthony Cooper and Locke in the flower shop in season 3. I don't really get into speculation about this, but the folks over at Sledgeweb like to note this. And they had a picture, so I figured I'd put it here! As for the Camaro, this is obviously the same car that Hurley and his Dad were working to restore. He must've been able to fix it! With his Dad? who knows??? It's confirmed pretty early that Hurley is being haunted by visions of his deceased buddy Charlie. But my only question was, even if he ran away from a ghost in a convenience store, why on earth would he be getting chased by the cops? Did he steal something? Or just cause a big scene? While Hurley is being detained in Police custody, the 2-Way mirror becomes an underwater scene with Charlie Ghost swimming around. 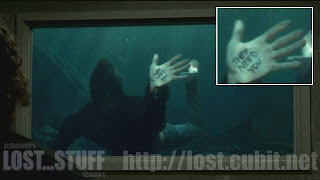 Charlie puts his hand on the glass and instead of it saying "Not Penny's Boat" it says "They Need You"
Hurley is questioned in the Police station by none other than Ana Lucia's old partner "BIG MIKE!" A guy with an extremely large mole on his face! Anyway, a little chilling of a scene occurs here when Mike starts bringing up Ana Lucia. And instead of Hurley getting all chummy with Mike and talking about their common bond, he lies and says he never met her. Not even before the flight. This raises many questions that we'll get to in a bit. It sure seems like this little off-island stint by the Oceanic 6 was never intended to be permanent. But then there was a visit of this mysterious man (Abiden or something? Anyone get the closed captioning on this? I'm hearing on the radio the name represents DEATH and Darkness and all of that fun stuff) claiming to be an Oceanic Airlines attorney. He was trying to persuade Hurley of an upgrade on his current location...but what he really wanted to know about was if "they were still alive" WHO are THEY? The Oceanic Survivors? The freighter People? The Others? This seems to also be part of the coverup alluded to by Hurley's Ana Lucia omission. And who is this mystery guy? Is he one of THE OTHERS on field assignment? (like Richard) Is he a Not Penny's Boat'er? Or is he actually from Oceanic Airlines? Or from somewhere else like the Widmore corporation? Wow, so many more questions to ponder!Whoever he is, he doesn't like to carry around identification. But he was still able to get a nice visitor ID! Hurley's future adventures didn't get any easier as Ghost Charlie finally cornered him and his crazy paintings. They discussed Charlie's premeditation to sacrificing himself for everyone else. Charlie gave out the quote "I'm dead but I'm also right here" oooooh chilling. This really is our first "VISION" off of the island. So if we thought these visions were restricted to just the island, apparently we thought wrong. Then again, Hurley used to have visions of DAVE in the looney bin. And we still don't know if the island was inducing the visions Hurley saw of him on the island either. From what I've been reading from the critics (since we can't get any info from the striking producer/writers! ), if season 1 was about survival, season 2 was about the Hatch, season 3 was about the Others, season 4 could very well be about the crazy Ghost visions everyone has been seeing (well...that and Flash Forwards, Freighter-dwellers and all of that crazy cool stuff!) Charlie also SLAPS Hurley to let him know he's real. And I mean, just the discussion they had makes it seem like it was real. But Charlie's final comment to Hurley could've really been his conscience talking "They Need You Hurley, You Know they need you!" But as we'll dive into in a couple seconds, that really doesn't seem to be the case. We must not forget though....the other patient claims to have seen Charlie too! That was pretty nuts! But I have to sidebar for a second - We were starting to associate these crazy visions people are having with the smoke monster, and we were told we were not barking up the wrong tree. So then the question becomes, does the smoke monster exist OFF of the island too? Or once you are exposed to the island, you're never the same? I dunno....am I asking the right questions here? who knows? Also fun to note that Hurley counted to 5 and Charlie disappeared. If you remember Jack talks in the pilot episode about letting the fear take him in for 5 seconds (that's all he was going to give it) and then it would go away. Kate, later in that episode, took the advice to heart. And of course it re-appeared in season 3 with the escape from the Hydra station. Not sure if these were supposed to be tied together...but still a good time! Ahh and then the culmination of the Flash Forward - Jack visits Hurley in Looneyville! Not sure why I got so excited by this! But I just find it so interesting to see these characters interacting OFF of the island! If we had any doubt that this flash took place BEFORE Jack's flash...it was confirmed here with Jack saying that he was thinking of growing a beard to avoid the press and the autographs and such. (The Oceanic 6 are indeed famous...but what was is the cover story? Jack saved 5 other people and that's it????) As for comedy - They still find ways to address the VIEWER commentaries even in future world. Everyone talked about how fake and awful Jack's beard looked in the flash forwards. Hurley got in a one liner "You'd look weird with a beard dude" LOVE IT! The big reveal of the flash forward was that this is one intense coverup...and it was enhanced by Hurley confirming he's not nuts but wanted to know if Jack thought he was and that he was going to "TELL" TELL WHAT???? ARGHHH!!!!! Time will tell! We also see a role reversal from the season 3 finale when Hurley is pretty much telling Jack "We have to go Back" but he added in that "IT" will stop at nothing to get them back. IT being the island? That's what I would think. It's all coming back to me - Jack saying "I'm sick of lying! We made a mistake! We have to go back" But earlier future Jack says "We're never going back!" Never say never dude. So I guess it's safe to say that Kate is going to get struck by this same bug at some point in the future? Hey, maybe she'll see the crazy black horse again and all 6 of them will fly on the horse back to the island! Okay, now I'm being a little silly. But I would totally buy it on this show! And of course, spoiling a bit of what's to come down below.....Hurley apologizes for siding with Locke to which Jack states is water under the bridge. Should be interesting to see how the island activity unfolds! Based on how the episode was dolled out to us...it's difficult to tell if this was actually a FLASH BACK to the flash forward or flash sideways to the flash diagonal. But, in the end, does it really matter? As long as we can tell when is when I am fine with it! We start in 2 different locations and eventually everyone meets up. There are the Radio Tower Dwellers and the Beach Crew. Let's keep them separate until we meet up further down. What started out as a happy occasion gets a little creepy when Wikowski (the guy on the radio, not sure right spelling yet) starts calling back asking for Naomi. Most people head on their way back to the beach. Jack, Kate, Rousseau, and Ben have another appointment. Wikowski needs a new signal from the satellite phone and only Naomi knows how to do it. So Naomi wasn't quite dead yet. She managed to escape leaving a trail of Blood. Kate claims Naomi led a fake trail, Jack still convinced they're going to get rescued, tells Kate to return with everyone else to the beach. He brings Rousseau and Ben (because he doesn't trust him with anyone except himself) to follow the trail. Ben continues his warnings about the Freighter folk. He is clearly frightened. Also, this is portrayed by Ben asking Rousseau to take Alex as far away as possible. So long story short Jack, Ben and Rousseau follow the wrong path just as Kate suggested. 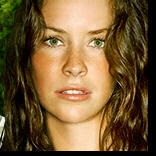 Kate stole the phone from Jack when they hugged and found Naomi...they rolled around in the jungle for a bit. Naomi was upset that the survivor's "figuratively and literally" stabbed Naomi in the back after her trying to get them rescued. But after some convincing from Kate they call the freighter and transmit a better signal. Then Naomi dies....RIP Naomi! Man, can you remember this show before BEN was on it? How fantastic is Michael Emerson? 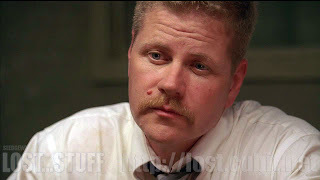 When this guy plays the role of a captive, he is just awesome. Tonight was full of sarcastic one-liners that might top some of Sawyer's. "ooooh riiight...i guess I should've told you about her taking the Satellite Phone! but you beat the crap out of me so I owed you one!" love it!!! So, Hurley tells Bernard he won the lottery but claims he will be free because they thought he was dead. I guess he didn't have his says his money in those Flash Forwards. Just the camaro he worked on with Dad. So the unlucky streak is over??? Desmond returns and warns everyone about the boat and the mood definitely changes from joy to fear. Gotta love Sawyer being sympathetic to Hurley and trying to talk to him about Charlie. Quality stuff! But Hurley's glimpse INTO Jacob's house shows a man yet again rocking the chair. 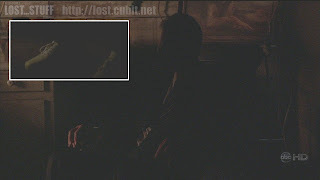 We had speculated before that the glimpse we got could be either Locke or Christian Shephard. Ironic that in tonight's episode....we DEFINITELY see Christian Shephard (and those crazy white sneakers) sitting in the chair! If anyone watched Missing Pieces episode 13 - you'll know positively that the Christian is wearing white sneakers...why?? was he buried with them? I dunno. I don't remember from Season 1's White Rabbit episode if he was wearing them either. (btw...i'll talk about my thoughts on the missing pieces at the end of the blog). I still do not take this as confirmation that Christian is alive. The producers have been so adamant that once you're dead you're dead. And Christian? He died! We haven't seen HOW he died yet. But we saw his corpse! But we've also seen a vision of him on the island. And I think we're getting closer to revealing what that's all about! I know I 've always hoped that he will be somehow involved in the masterminding of this whole island experience. But who knows if that will be the truth or not. But we do know he plays a key role in many of the survivor's lives (possibly some yet to be seen). I talked about the irony of our previous speculation being of Christian AND John Locke. 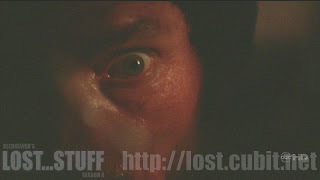 Well an EYE peeks out at Hurley...and it's none other than John Locke's blue eye! I went back and forth on this, but the screen capture clearly depicts Locke's eye! Which makes sense because he mysteriously shows up to Hurley with Hurley's torch right after. Remember Jack and Kate discussing how Locke just vanished from the Radio Tower? And what about him being in the Shack that was appearing in various locations? Perhaps his rescue from the Dharma Ditch has put him into some kinda unison with the island and Jacob. Perhaps Locke IS Jacob...perhaps Christian is Jacob too?? Perhaps we ALL are Jacob in our own way! Perhaps I'm just as confused as ever! That's probably the most likely scenario! I was going to go out on a limb and possibly suggest that maybe Locke actually DIED in the ditch. And there probably are facts to support it, now that Ghost Charlie is out there talking reason with Hurley. I thought it would be an interesting concept to delve into....but I think there's too much still to explain with Locke being ALIVE with his whole magical healing and the freeing of the wheel chair! But...still worth noting the possibility so if it turns out to be true...I can reference this statement and say "I KNEW IT!!!!" even though I really didn't! So key plot point here is that Locke convinces Hurley to back up his belief that the Freighter folk are bad. He asks Hurley to help him convince Jack in order to prevent Charlie from dying in vain. And thus the moment we were all waiting for, didn't take 6-12 episodes (season 3) or 9 episodes (season 2) for it to happen. It happened in 1! (this is why i can forgive the Walkie getting thrown into the ocean!) All of the survivors meet by the Fuselage of Flight 815. The Man of Science (Jack) and the Man of Faith (Locke) are once again at odds. Locke is heading to the Barracks and wants everyone to join him. Jack is heading to the beach to get rescued and assumes everyone thinks Locke is crazy just like he does. Yeah...did I mention Jack said he was going to kill Locke when he saw him? Well he certainly tried! Taking his gun, beating him down...and then ....yep...PULLING THE TRIGGER! Woa...gun wasn't loaded...wasn't ever loaded. Locke never intended to kill Jack! Just the potentially bad person Naomi! Hurley's touching reveal to Claire that Charlie is dead was rough stuff (tied in with the flash forward to Hurley talking to Charlie made the blow a little easier to deal with!). But it was followed by his speech to follow Locke "FOR CHARLIE!" "I'm not listening to you! 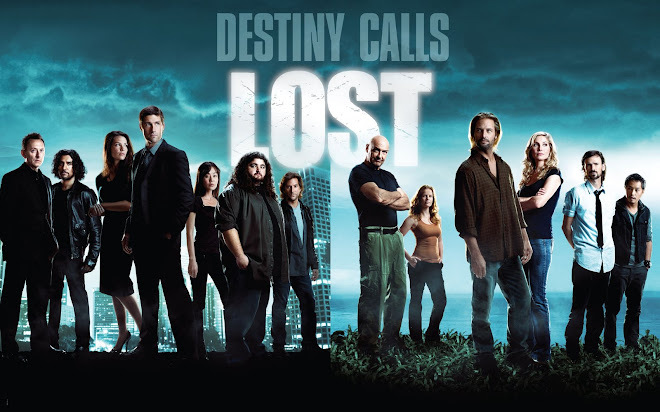 (Jack)" Hurley later apologizes for siding with Locke....so what on earth happens between then and the future to get Hurley rescued? And whoever else??? Crew that follows Locke: Claire (& Aaron so much for Desmond's vision for now), Hurley, Rousseau, Ben (who shot Locke but still wanted to go! Really fears the freighter! Should be interesting with the Ben/Locke dynamic), Alex, Karl, Sawyer (upsetting Kate) and randoms. Rose and Bernard - "I'm not going anywhere with that man" This is interesting because Locke and Rose used to be on the same page with the healing powers of the island. Perhaps Rose is turned off by Locke's murder of Naomi? But will she want to be rescued? Bernard is still willing to stay put with her. 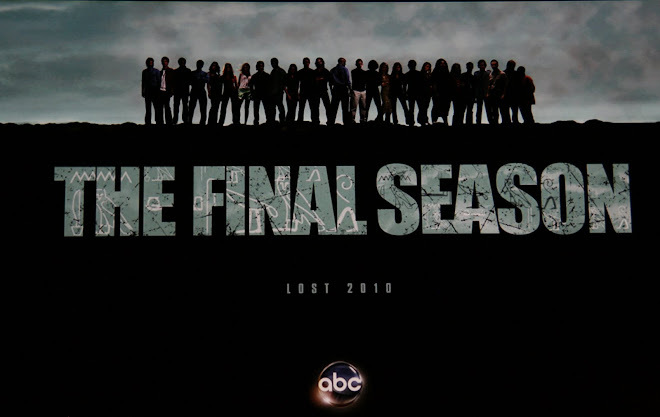 Kate, Sun, Jin, Sayid, Juliet, Desmond and more randoms (or should we call them Nikki's and Paulo's ????). I'm going to assume Sayid is sticking with Jack because he wants to see this freighter with his own eyes. He was willing to hear Locke out and was concerned about Charlie's message. I guess we'll see what happens there! Another great one liner with Ben "Jack, with your permission I'd like to go with John!" Such a simple line, but Emerson saying it gives it so much more effect! Another interesting thing to point out. Remember when Locke was in the early stages of becoming one with the island and he was able to predict the rain? How about that downpour that started once the sides were chosen? Did you see Locke's face? He seemed very confused...like he did NOT predict this one. Am I looking into this too much? Crazy! Also, when Jack and Kate stayed behind to look into the fuselage...I'll admit it...I did my own flashback to the pilot episode and knew that someone was missing on that visit. Good ol' Charlie. Very sad stuff. Jack asks how did we get here? Almost the follow-up question to Charlie's infamous "Guys, where are we?" They didn't have too much time to ponder because the thunder turned into a helicopter and another parachute fell from the sky.....and the man attached to this chute was none other than the French Translator guy from Saving Private Ryan! Is this Wikowski? We got one line from him "Are you Jack?" and then BOOM!!! LOST! Guess we'll find out next time! Wow...do I know how to be wordy or what? Well we're not done yet folks! I have 2 more segments that I added to this blog. And then we'll say Namaste until next week! I figured we should try to have an ongoing segment about updated theories on who was in the coffin at the end of season 3. At this point, I'm going to say it was NOT one of the Oceanic 6 (but that's because I don't know who the 6 are). I'm still going to say it was Michael, because well he was NOT a member of the Oceanic 6 (we don't think)....he probably had to create an ALIAS name when he left the island because he couldn't tell anyone what happened. (Perhaps that alias is the name found that we could almost read in the newspaper clipping). Jack MIGHT feel some sympathy for him and attempt suicide (okay..stretch). But fully understandable that Kate would not want to go to the funeral. OR...no one would show up for the funeral because no one knew he was still alive. Also, the neighborhood that the viewing was in would suggest that it would be someone of Michael's cultural background. I just can't remember if Michael was originally from New York though??? And I guess if it was Michael, it could've been Walt too. Theories still are going crazy with Sawyer, Ben, Locke, etc.... But I really don't think so at this point. I also pondered ROSE because of her cancer if she left the island. Jack might feel a little guilty about that. Anyone else have any thoughts? That's it folks. Great episode once again. Sorry for being wordy! Sorry for any typos (just want to get this out to people) See you next week for Episode 2 "CONFIRMED DEAD" Oooh chilling title! NAMASTE!